If you're trying to find out whether you or another entity has a Hawaii Tax License, the State of Hawaii has a handy webpage. The webpage can be difficult to find and that's why I'm writing about it! Persons and companies doing business in Hawaii are supposed to file Hawaii State income tax returns and have certain other tax returns. For example, a company doing business and having employees should have an employers withholding tax ID. Persons doing business as independent contractors should have General Excise Tax (GET) licenses. If you have a rental property, the income is subject to GET and you should have a license. If your property is used as a short-term rental (rented for periods of 180 days or less, according to the State of Hawaii) then a Transient Accommodations Tax (TAT) license is also applicable. Sometimes people have forgotten whether or not they have a tax license or they've forgotten their tax ID number. This is especially applicable in 2017 as the State of Hawaii just CHANGED all the tax ID numbers in late 2016 and the new tax ID's must be used in 2017. Here's how to do it. 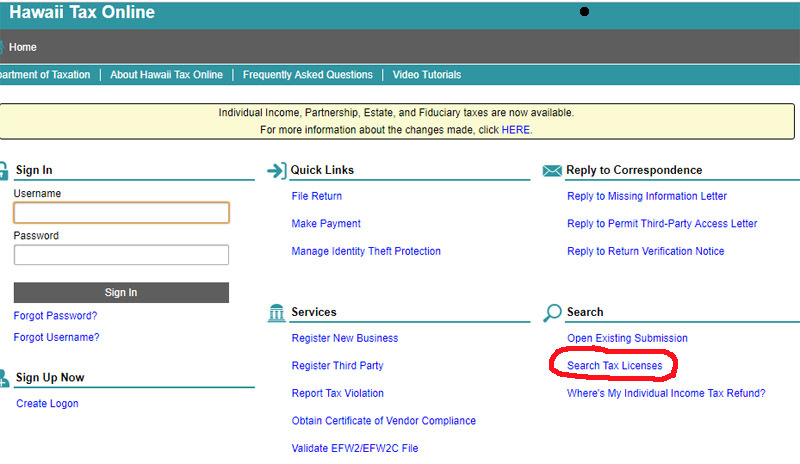 Click this link to the Hawaii Tax License Search portal. When you get to the page below, click "Search Tax Licenses". This is what the search page looks like. Fill in at least one box (taxpayer ID number, taxpayer name and/or dba name) and search for the tax license. The first box - Customer ID (new format) refers to the new General Excise Tax license numbers now in effect and issued to licensees in late 2016. These new license id's are preceded with the letters GE and are followed by 12 numbers. The second box refers to the old GET numbers used through 2016. The id's are preceded with a W followed by 10 numbers. The third box is the most commonly used, searching by the taxpayer's name. Input the last name and to narrow the search you can include the taxpayer's first name. The fourth box DBA stands for "doing business as". If you applied for a tax license in the past and aren't sure of its status you can lookup your own license. You can also check on other persons and businesses to see if they are licensed. Being licensed does not guarantee the legitimacy of a business but it helps. The search results indicate the date the business started and whether the tax license is still active. In some cases a mailing address is available. If the property you're selling has been used as a rental then General Excise Tax (GET) should have been paid on the rental income and State of Hawaii income tax returns should have been filed. Consequences of not having filed include problems with obtaining early HARPTA refunds. What is HARPTA? It's a State of Hawaii withholding of 5% of the selling price of real estate when the property is sold by persons who are not Hawaii residents. It's possible to get a partial or total refund of HARPTA, in many cases a GET number is required. If you don't have a GET number then getting that early HARPTA refund might be a problem. If you're thinking of selling Hawaii property and need more info, feel free to contact me!